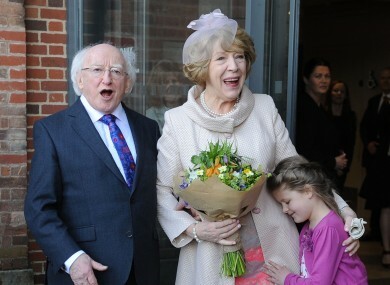 President Higgins and his wife Sabina on their State visit to the UK. PRESIDENT MICHAEL D HIGGINS is likely to be the last person to receive the ‘Freedom of Cork City’ before the framework for choosing recipients is overhauled. Local councillor Emmet O’Halloran said there was “cross-party agreement” at the last council meeting on the need to review how recipients of the honour are chosen. A sub-committee on the issue is likely to be set up following May’s local election. O’Halloran said that people wanted “more transparency in the process” as some mayors have been accused of using the accolade as a “political football”. At present, the Lord Mayor proposes that an individual should win the award and the city council votes on it. The Fine Gael councillor said a set of criteria on which to judge potential recipients should be drawn up, adding that they “should have some connection to Cork and, if not to Cork, to Ireland”. He noted that everyone who has been bestowed the honour to date was “deserving” but said “it’s being given out too frequently”. The freedom of Cork, or any city, is something that is very very sacred … What’s sacred is scarce. The award has been bestowed on five people since 2010, while the ‘Freedom of Dublin’ has been given out just eight times since 2002. O’Halloran stated: “Ultimately, it’s an accolade given by the people of Cork”. However, he stopped short of saying a public vote on whom to award the freedom of the city to should be allowed. People elect councillors to act on their behalf … It’s the freedom of Cork, not the freedom of the councillors of Cork. He described President Higgins as an “extremely worthy recipient” and said today’s ceremony was given ”extra panache” since his recent State visit to the UK. “People are very excited,” he added. Labour Lord Mayor Catherine Clancy said President Higgins was receiving the honour due to his “commitment to public service” and “outstanding achievement in advancing civil rights and social justice nationally and internationally”. Six previous Irish presidents have been given the award, as have US President John F Kennedy, former Taoiseach Albert Reynolds and politicians John Hume and John Major for their work on the peace process in Northern Ireland. Email “Freedom of Cork to be awarded less often to avoid mayors using it as a 'political football'”. Feedback on “Freedom of Cork to be awarded less often to avoid mayors using it as a 'political football'”.